Halvah is a sweet treat that is almost universally beloved by Jews from around the world. Even in many American grocery stores you can find packaged halvah, and Israel is well known for the rows upon rows of beautiful and varied halvah flavors featured in its many outdoor markets. We recently had the chance to spend time with Rachel Simons of Seed + Mill, an artisanal tahini and halvah company located in New York City’s Chelsea Market, who shared some important and interesting facts about tahini and halvah. Tahini is quite simple: It is ground sesame seeds. Just like ground peanuts create peanut butter, ground sesame seeds creates a rich, sweet and savory paste that is delicious and versatile. Not all sesame seeds are created equal, and, according to Rachel, the best-quality tahini is made from Ethiopian sesame seeds. When ground, they have a delicious nuttiness with a natural sweetness. You can read this to learn more about tahini. What should you look for when you buy tahini? Let’s say you can’t make it to Seed + Mill (though you can order from its website) and you want to buy tahini at the grocery store. Rachel says you should check for freshness. While tahini has a long shelf life (it can remain in your pantry for 2-3 years), if you see that the tahini has already separated, with a thick layer of oil on top, it is not fresh and not ideal to purchase. Where should you store tahini? While you can store it at room temperature, Rachel strongly recommends storing it in the fridge for sanitary reasons. But the answer is really either. And when the tahini fibers and oil do separate over time (which they will), just give it a good stir before using. What can you do with tahini? The question is really: What can’t you do with tahini! It can be savory, it can be sweet. It can be simply drizzled over roasted vegetables, made into a salad dressing or even added to baked goods like gluten-free tahini and halvah brownies and tahini chocolate breakfast buns. It can also be drizzled on top of ice cream, like in this labne ice cream sundae, or as Rachel demonstrates in the video below. Halvah, which literally means “sweet” in Arabic, is made by mixing tahini and sugar at a high temperature. Other flavors are often added, including coffee, marble, pistachio, cardamom and white chocolate. 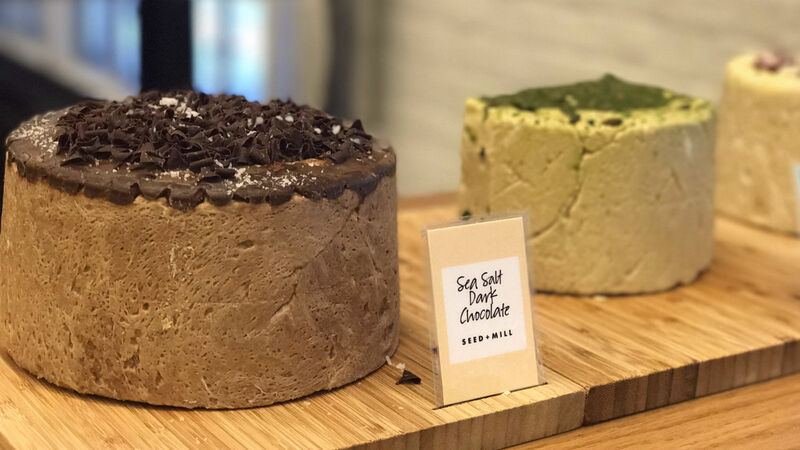 Seed + Mill prides itself on bringing contemporary flavors like ginger, sea salt and chocolate, and even pumpkin spice to its halvah offerings. Watch the full video below, but get ready to drool over all the beautiful halvah and other creations. Still hankering for more ways to eat tahini? Check out these 21 Ways To Eat Tahini, Beyond Hummus.